12:05 p.m., Dec. 4, 2015--Members of the University of Delaware community remember Kevin Thomas Miner, a former student from Warrington, Pennsylvania, who died Nov. 11, after a courageous two-year battle with brain cancer. He was 21. Mr. 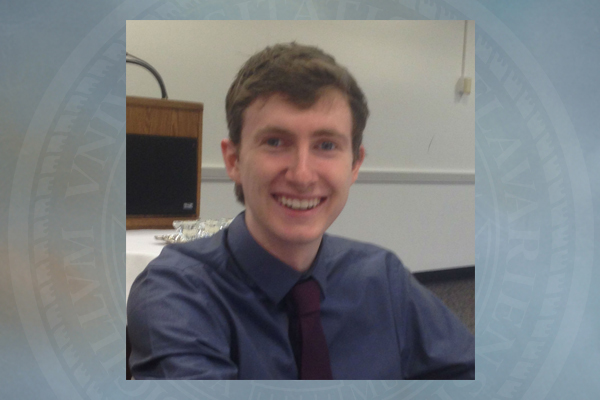 Miner was a cognitive science major and earlier a chemical engineering major. He was diagnosed with cancer in April 2013 and continued going to class while undergoing treatment. He was able to complete the fall 2014 semester. All flags on campus will be flown at half-staff on Wednesday, Dec. 9, in his memory. "On behalf of the entire University community, I extend our deepest condolences to Kevin's family and friends," said José-Luis Riera, dean of students. "It was a pleasure getting to know Kevin," said Catherine Stoner, associate director of the Delaware Biotechnology Institute. "He was an inspiring young man, and he was definitely a fighter. He always kept a positive attitude and a smile on his face. He never let his diagnosis hold him back from working toward his career and life goals. He will be deeply missed and never forgotten." Raul Lobo, Claire D. LeClaire Professor of Chemical and Biomolecular Engineering, said, "I am deeply saddened by the passing of Kevin Miner after his long fight with cancer. I remember what a delight it was to meet him for advising since he was so enthusiastic about being at the University of Delaware and about all the new things he was learning at UD. He really enjoyed being a college student. He took his illness stoically and kept challenging himself with a demanding academic load. I will miss him greatly, and my thoughts are with his family during these difficult times." Chuck Shermeyer, assistant dean for undergraduate services in the college, recalled meeting Mr. Miner just once to discuss resuming his studies after being off school for a bit. "My intention was to convince him to restart slowly, but it was soon clear that was not his plan. In spite of continued significant health challenges, he wanted to be fully engaged, stay the course, complete his degree. I still think back to that one meeting and how much I admired his determination and courage." According to his obituary, Mr. Miner never complained or showed self-pity but always had a positive attitude, a great smile and was an inspiration to all. It reads, in part, "Kevin loved spending time with his family and friends, and playing with his dog, Sandy. He was a gentle and loving person who had many interests including violin, theatre and karate." He is survived by his parents, John and Carol Miner; his sister, Elizabeth Miner; paternal grandmother, Opal Miner; and aunts and uncles Steve and Betty Miner, Diane Carmen, Donald and Donna Miner, Barbara and Don Bryant, Russell and Celeste Corcoran, and John and Teresa Tyrrell, as well as cousins Caitlin, Colleen, Maura, Carlye, Katie, Colin, Evan, Drew, Brian, Jonathan, Brandi and Niki. A funeral mass was held Nov. 17 at St. Cyril of Jerusalem Church in Jamison, Pennsylvania. Memorial contributions may be made to the National Brain Tumor Society or to First Descents. Condolences may be left online at the Shelly Funeral Home webpage. UD students in need of support and assistance are encouraged to contact the Center for Counseling and Student Development at 302-831-2141. In addition, the staff in the Office of the Dean of Students is available to meet with any student who wishes to talk. Call 302-831-8939 to schedule an appointment or stop by 101 Hullihen Hall.